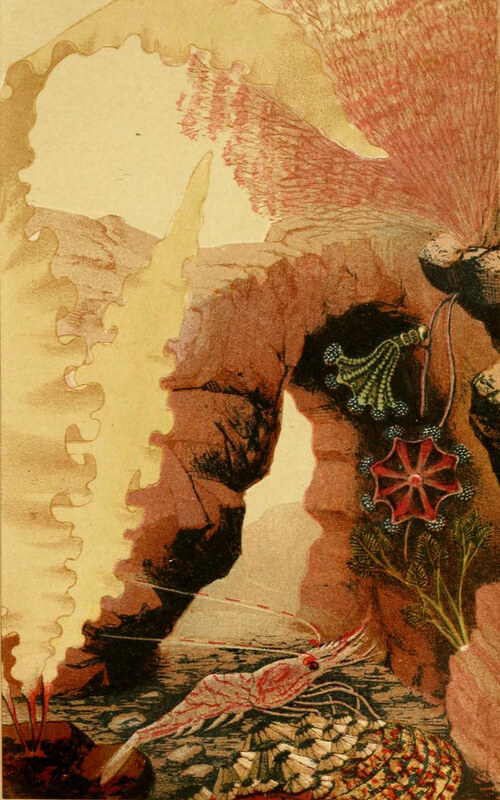 Bernd Brunner on the English naturalist Philip Henry Gosse and how his 1854 book The Aquarium, complete with spectacular illustrations and a dizzy dose of religious zeal, sparked a craze for the “ocean garden” that gripped Victorian Britain. 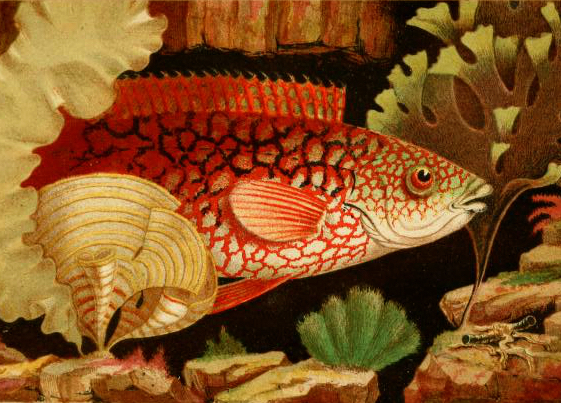 “The Ancient Wrasse”, a detail from the frontispiece to The Aquarium (1856, 2nd edition) — Source. Gosse was born in 1810 in Poole in the south of England, the son of an impoverished travelling miniature painter. As a young man Gosse made his way across the Atlantic to Newfoundland, where he dealt with seal and cod ﬂeets in the Carbonear harbour. In his early twenties he bought a copy of the book Essays on the Microscope at an auction and thenceforth devoted himself wholeheartedly to collecting insects. For two years he documented every insect he could get hold of. Along with some of his friends, he decided to move to mainland Canada in hopes of establishing a rural commune and opening a museum of stuffed birds. 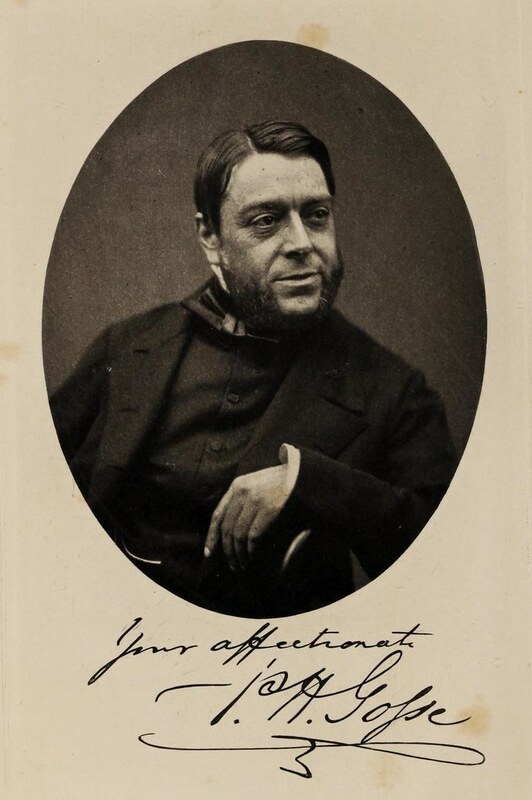 After both ventures failed, Gosse returned to England, where he found work as a teacher in Hackney until he received an invitation from the Society for the Promotion of Christian Knowledge to write An Introduction to Zoology. His research for the book inspired him to write another, The Ocean, published in 1844, on the findings of the explorer Sir James Clark Ross, who since 1818 had travelled throughout the Pacific and Arctic discovering a wide variety of marine ﬂora and fauna. The book was an unexpected success and Gosse’s newfound notoriety led to an invitation to Jamaica later that year — a trip financed by an avid seashell collector in return for specimens to add to his collection. Gosse’s time in the Caribbean gave birth to three further books, all successes, and the author established himself as an important voice among the publishing naturalists of the period. Upon his return from Jamaica, Gosse became a devout Christian, a faith that would shape much of his subsequent work. Through his wife, Emily Bowes, he became involved with a sect called the Plymouth Brethren Movement. His life was dictated by the monotony of seemingly endless prayers. Reading novels and poems as well as going to the theatre or singing temporal songs was forbidden — even social contacts outside the brotherhood were not permitted. Gosse strongly believed that Jesus Christ would return to Earth before his own death, and, under this sense of urgency, he set about to work on several book projects, all of which dealt with life on the coast. Gosse could either be found sitting behind his desk or working outside, where, dressed in his black suit, he fervently poked around in the silt of the tidal shallows or — even during heavy surf — meticulously examined the waterholes in rocks for any living creature. He became an authority for everything connected to coastal fauna, and his frequent speeches in London were always met with acclaim and adoration. Philip Henry Gosse as he appears in the frontispiece to The Naturalist of the Sea-shore: The Life of Philip Henry Gosse (1896) by his son Edmund — Source. Of all Gosse’s works, the most successful was The Aquarium, in which he described his observations of coastal life and — a year after establishing the first public aquarium at the London Zoo — gave his readers instructions on how to build a miniature ocean of their very own. A saltwater aquarium, he asserted, was the perfect way to get acquainted with the peculiar creatures of the ocean without having to descend into the depths using complicated diving equipment. He was amused by a French zoologist, Henri Milne-Edwards, who stalked around at the bottom of the Mediterranean wearing a “water-tight dress, suitable spectacles, and a breathing tube” in order to take a closer look at the submarine world. All this was so much easier to achieve, Gosse proclaimed, in the safe environment of one’s own four walls. 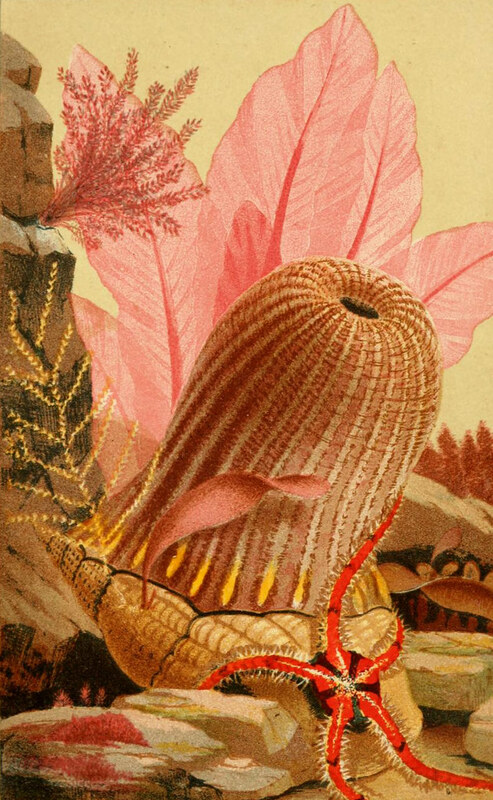 Scene of Actinoloba in a lithographic print by William Dickes based on a drawing by Philip Henry Gosse, featured in Actinologia Britannica: A History of the British Sea-Anemones and Corals (1860) — Source. 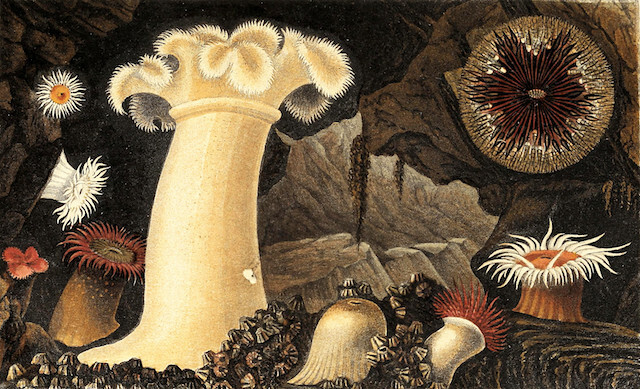 Scene of Tealia, in a lithographic print by William Dickes based on a drawing by Philip Henry Gosse, featured in Actinologia Britannica: A History of the British Sea-Anemones and Corals (1860) — Source. The plant had to be removed together with a piece of the rock on which it grew; only this way did it have a chance of survival. After skilful chiselling (often under water), each piece of grass found its temporary home in a receptacle that had been brought along. It was even more important to have a suitable transport container handy when collecting animals. According to Gosse, a collector should always be watchful and alert, as strange creatures of various forms and shapes could appear at any moment. Illustration featured in The Aquarium (1856, 2nd edition). 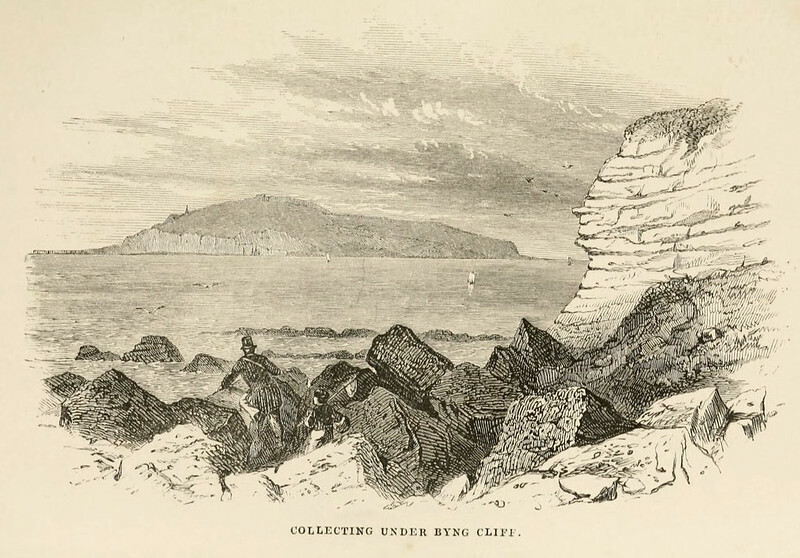 This area of coast (thought to correspond to what is now called Newton’s Cove, near Weymouth in Dorset) was a fertile hunting ground for Gosse, and where he came across the rare jellyfish “Goblet Lucemaria” (Depastrum cyathiforme) — Source. Upon returning from his seaside excursion, Gosse would begin the process of transferring his findings from the temporary tanks into his marine aquarium. The exterior of Gosse’s aquarium already resembled the familiar rectangular glass tank with birchwood beading. It was 61 × 30 × 30 cm (2 × 1 × 1 ft); the sides and ends were panes of glass and the bottom was slate. The panes were puttied between the birchwood, which was a tremendous improvement over earlier prototypical aquariums, as the even glass surfaces did not cause the optical distortions that round glass did. Gosse covered the bottom of the aquarium with an insulating layer of clay, pebbles, sand, and, finally, small pieces of rock, which formed mini-bridges and overhangs that gave the swimming creatures shelter. After adding the plants, Gosse poured 76 litres (20 gallons) of salt water over the miniature landscape. During the first night, Gosse would observe the tank by candlelight and see that numerous tiny shells and micro-organisms were already bustling around inside. The animals were added the following day. Among the specimens were one 15-spined stickleback, seven grey mullet, one black goby, three common periwinkles, one anomia, two common cockles, two ascidia, two hermit crabs, four sand shrimp, one prawn, three crown worms, two thick-horned anemones, and many others. All in all, around one hundred animals found a new home in the tank. Although the tank could handle even more, and two or three gallons of saltwater per day were constantly dripping into the aquarium from another vessel suspended over the tank as “artificial aeration”, it dawned on Gosse that the consumption of oxygen would soon exceed its supply. The first week of his experiment proved to be successful (apart from one or two attacks on weaker animals by predatory species). But three days into the second week a number of animals died, and the water developed an unpleasant smell from those that had died in the sanctuary of the stones. After thoroughly cleaning the tank, Gosse carried on his experiment with the remaining fauna and ﬂora. “The Aesop Prawn”, from The Aquarium (1856, 2nd edition) — Source. “Parasitic Anemone”, from The Aquarium (1856, 2nd edition) — Source. In fact it is a relationship between only two living creatures, because just the whelk’s shell remains, no longer inhabited by the original mollusc. Gosse defined crabs as “the scavengers of the sea” which, like wolves and hyenas, devour everything alive or dead.11 The sea anemone — also known as the animal ﬂower, polyp, or by its scientific name, Actinia — with its colour-changing tentacles, can often be found sitting on stones on the ocean bed, expanding to great lengths before shrinking to a tenth of its size. Equally fascinating, pieces of the creature could break away and develop into new animals. 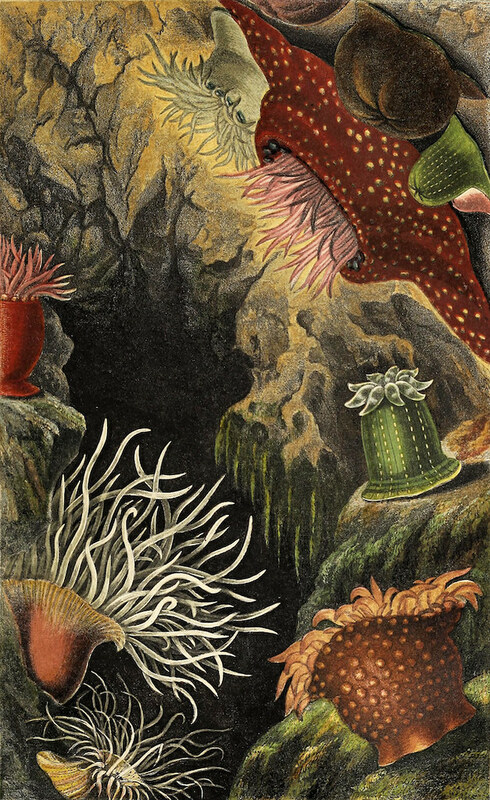 Due to its ﬂower-like appearance, the sea anemone was for a long time mistakenly considered to be the “missing link” between plants and animals. The symbiosis of hermit crab and sea anemone is — according to Gosse — open to all possible speculation and interpretation. Who is actually in control? Is it the crab, pulling the anemone along the ocean bed, striking it with scattered stones? Or has the sea anemone devoured the shell together with the crab, and has the crab then managed to ﬁnd a way out through the stomach and skin of the sea anemone? Has the sea anemone released a special membrane which, while allowing the crab a suitable home, prevents it from ever leaving? With the help of the aquarium, Gosse hoped to discover the principle of their opposite attraction and the secret of the apparent melding of bodies and identities. However, it was not until the 1920s and 30s that biologists were able to offer plausible explanations for this interaction, which is now regarded as a prime example of biological symbiosis. Sea anemones use their nematocysts to keep octopuses away from the crab and in return are able to gain a much bigger habitat due to the host’s movements. Additionally, the sea anemone can ingest some of the crab’s prey as its mouth directly faces the masticatory organs of the crab. This relationship can, however, end in tragedy: if the hermit crab cannot ﬁnd enough food, it will eat the sea anemone. 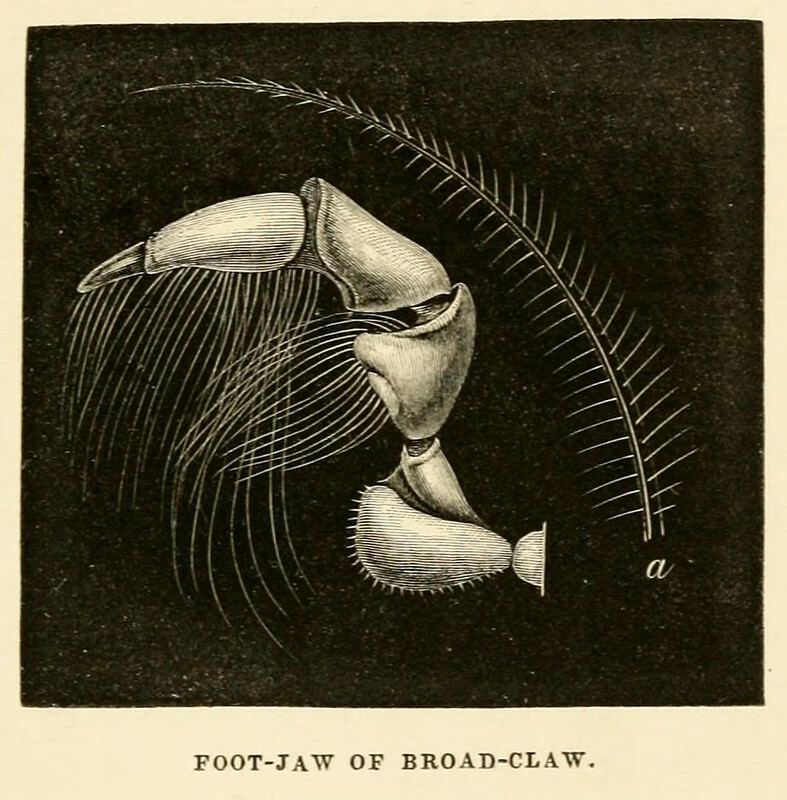 Illustration featured in The Aquarium (1856, 2nd edition) — Source. For Gosse the aquarium was a living museum, a curious inversion of Noah’s Ark — all species of marine fauna and ﬂora, safely held amidst a dry environment. Comparable to the zoological gardens that brought the animal kingdom to cities or the botanical garden hothouses that showcased tropical ﬂora — living compendiums through which nature lovers and ﬂâneurs alike could wander — the aquarium encapsulated the submarine world into a “see-through” form, the paradox of an ocean journey within one’s own home. Gosse had a way of expressing his enthusiasm in his books and articles that positively stirred the bourgeoisie. His numerous lectures on oceanic subjects always caused a sensation. 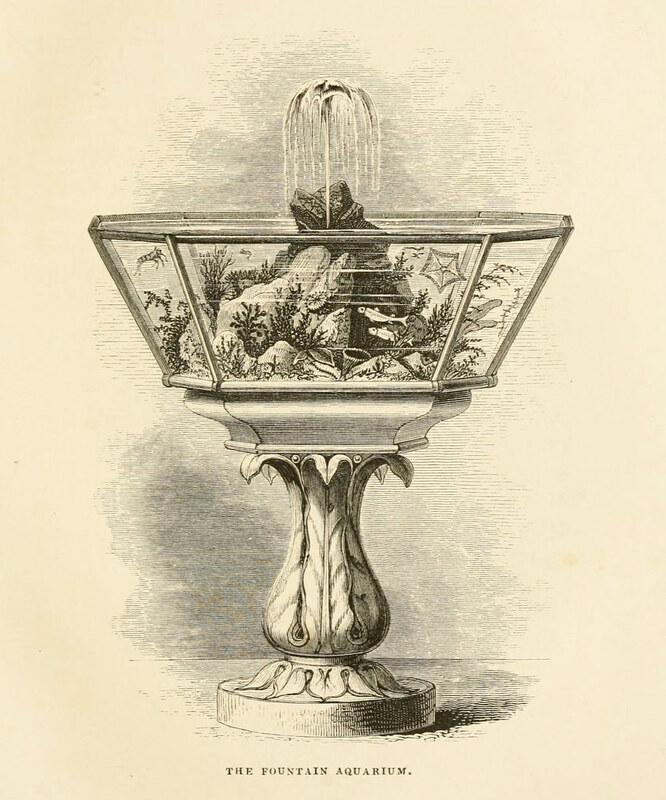 According to the Literary Gazette, a Victorian magazine published in London, Gosse had “dived into all those decorated palaces which had unassertively been kept under lock and key by old Neptune for such a long time”;12 another chronicler wrote that “all the world wanted to possess an aquarium to verify his assertions and repeat his experiments”;13 the magazine Blackwoods even recommended that children should not see the book, otherwise there would be no peace and quiet in the house until the children were ﬁnally allowed to have an aquarium. But the burgeoning fad needed more than Gosse’s contagious enthusiasm to be a success: it also had to please the eye. High-quality illustrations, which were quite rare at the time, played an important role in the success of most of Gosse’s books. He had inherited his father’s artistic talents and is credited with providing the drawings for many of the beautiful lithographic plates that accompany his texts. According to the scholar Barbara T. Gates, it was, however, his wife Emily — a talented artist trained by popular landscape painter John Sell Cotman — who made the drawings for the stunning plates found in The Aquarium.14 Although her images proved so integral to the book’s popularity, she is entirely uncredited on its pages, her husband’s name inscribed below the images instead. While it was general convention at the time for picture credits in scientific publications to default to the text’s author, one does wonder why Henry failed to mention his wife’s contribution at all in his preface, despite finding room to acknowledge the lithograph printers. 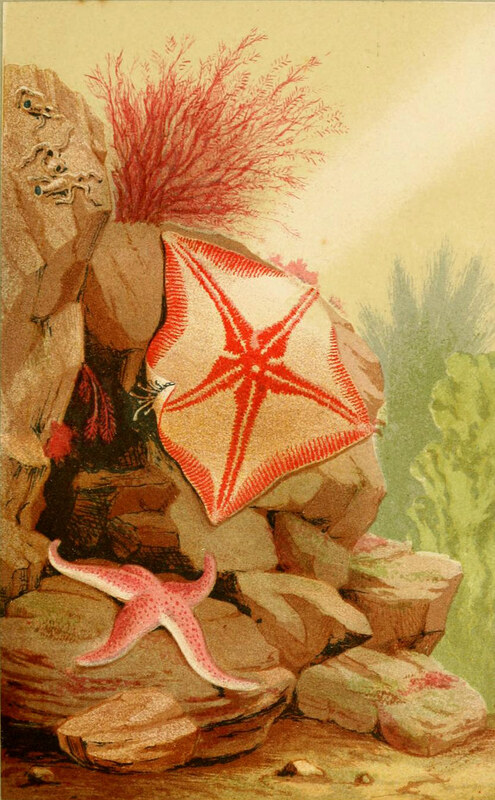 “Starfish”, from The Aquarium (1856, 2nd edition) — Source. 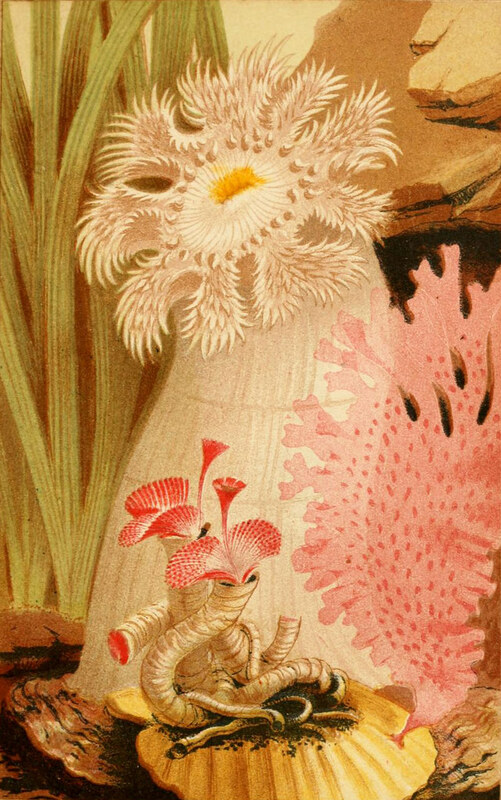 “Plumose Anemone”, from The Aquarium (1856, 2nd edition) — Source. A shop on Portland Road in London, owned by William Alford Lloyd, established itself at the beating heart of the fad. Fifty large tanks and countless smaller containers held some 15,000 marine specimens. The emporium sold salt water over the counter by the pint, quart, or gallon. Aquariums were manufactured in a nearby factory, and Lloyd employed more than a dozen people for the purpose of collecting plants and animals from the coasts and purchasing lots from amateur collectors. Before the existence of Lloyd’s shop, people had to make excursions out to the coast, and transportation was often expensive and dangerous, which made the whole undertaking quite unappealing. Once Lloyd went into business, aquarium lovers could obtain everything they needed easily and frequently. Illustration featured in Ocean Gardens: The History of the Marine Aquarium (1857) by Henry Noel Humphreys — Source. 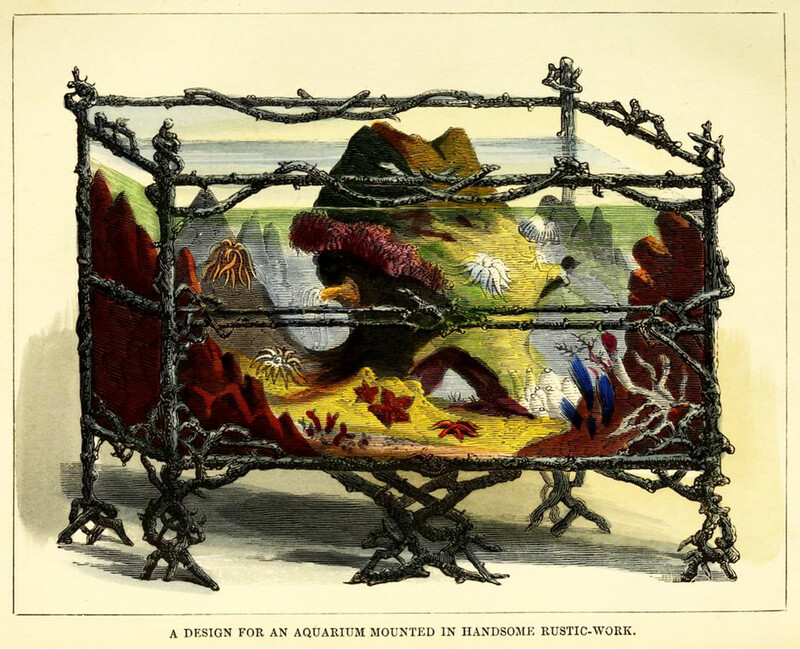 The aquarium craze of the 1850s, however, was just that: a craze. According to the British social historian David Elliston Allen in his fascinating study The Naturalist in Britain, the wave of nature enthusiasm in the 1850s was “sloppier, less intelligent, more given to hysteria” than in the preceding decades.16 Only a few years later, “aquarium mania” was already a thing of the past, at least in Britain. Nine out of ten aquariums had been either dumped or simply left to their own devices. The individual experience of the parlour gave way to the collective experience of the large public aquariums found in Brighton and other coastal resorts. Bernd Brunner writes at the crossroads of culture, history, and science, and is the author of, among others, Birdmania: A Remarkable Passion for Birds (Greystone Books, Allen & Unwin), Bears: A Brief History (Yale University Press), and The Ocean at Home: An Illustrated History of the Aquarium (Reaktion Books), from which this essay is based. Website: www.berndbrunner.com.